This is a template I put together for a class yearbook. 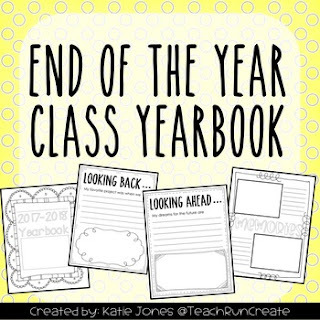 Students can record their favorite memories, write about what they learned, explain what they are looking forward to next year, plus many more writing topics. Every page has a space for students to draw a picture. There is a word search page with common school related words. I've also included 2 autograph pages. There are 2 pages for class memories. Personally, I use this spot for students to glue in pictures I have taken but it can also be used for students to draw additional pictures.